Nepal has seen drastic improvements in healthcare. People are now living longer and healthier and there are many hospitals and clinics across the country. However, the country’s health system is still far below the international standard. Volunteers participating in the healthcare volunteer project in Nepal will learn a lot about the healthcare practices in a developing country. As a volunteer, you will work in a community hospital or health post, shadowing local medical professionals. You will help doctors, nurses, and other medical staff during treatment of patients with minor injuries. Apart from that, volunteers will also work in record keeping, help in sanitation project and participate in other on-going health programs. NVCYE invites volunteers from around the world to contribute to this impactful as well as rewarding medical volunteer program in Nepal to help increase underprivileged people’s access to proper medical services in Nepal. Note: This project is mainly for medical students, professionals or someone who has some level of healthcare experience. You must provide proof of this. Volunteers are required to pay a minimum donation of $75 every two weeks while participating in this project. This donation amount will go straight to the hospital/health organization. To contribute to the development of the society by improving the health care services provided by Martyrs Memorial Public Health Co-operative Society Limited. The aim of this healthcare volunteer program in Nepal is to provide quality health care services at affordable costs for the local people. It is community based hospital which provides wide range of health care services, including allopathic treatment. SHAHID MEMORIAL HOSPITAL is located in Kalanki, which is the main exit and entry point to Kathmandu. Interested candidates participating in our medical volunteer project abroad in Nepal must be above 20-years-old or equivalent. You should be a medical professional or a medical student and should show some medical credential to participate in this project. You are also expected to be patient, open-minded and should respect Nepalese cultures and traditions. The tasks assigned to volunteers depend on their qualification and education background. For the doctors, the management team of Shahid Memorial will provide them opportunity to work under the supervision of doctors and other health staff. The volunteers can shadow the doctors during their rounds to observe the treatment procedure. For the Nurses, the chief nurse is responsible to assign them tasks, which would mainly focus on patient care, taking vitals of patients, giving medication , providing health care counseling , including taking care of the patient in the ER, ICU and operation ward . For the physiotherapist, the physiotherapy department is responsible to provide them various tasks related to physiotherapy. The hospital management closely monitors and guides volunteers during their assignment to avoid any confusion in their work. This is because the healthcare system and treatment procedure is very different in Nepal compared to other countries. 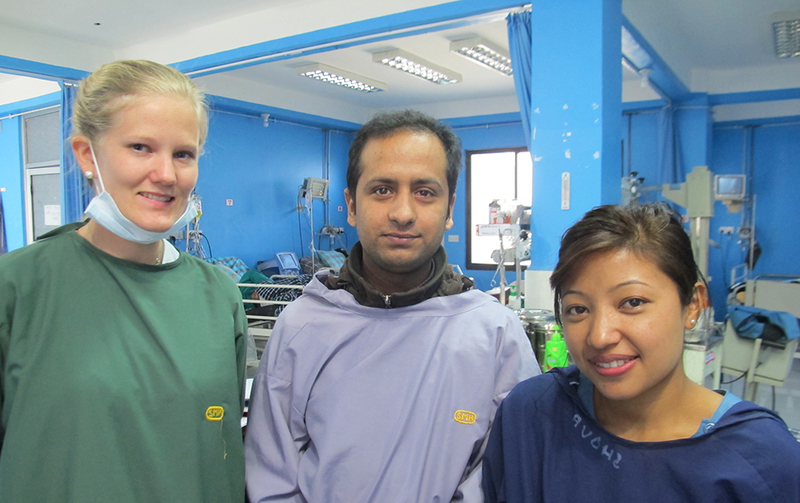 Maximum two volunteers can work in this medical volunteer project in Nepal. Volunteers need to check with the hosting organization in advance to see if the project is still available. Volunteers will stay in a hostel located nearby the hospital. It just takes 5 minutes for you to reach the hospital so there is no need to take any kind of transportation from the place where you will be living. You will be sharing rooms with volunteers of other nationalities participating in the same program. Lunch & dinner is provided by the hostel during your volunteer work in Nepal. Food is prepared in local style. The main types of food will be rice, lentil soup and vegetables, but once a week the hostel will provide you meat in your lunch or dinner. For vegetarians the choice is usually limited to rice, vegetables, lentil soup and pickle.